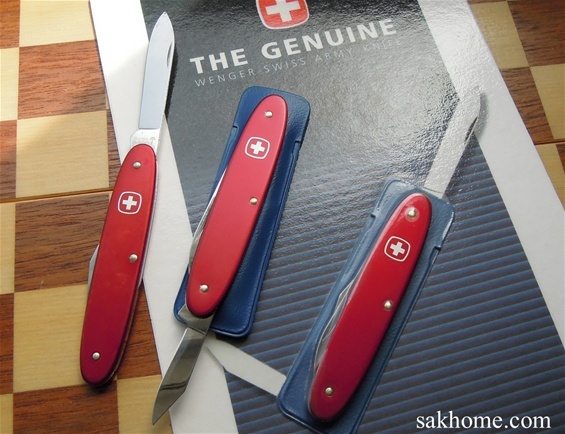 Here are some interesting Wenger 1.84.00 S knives and these are knives with anodized Aluminum handles with red color. Eloxy is a term used for these knives but I am not sure when this name entered and if this applies to these. I have been looking for some further information on them and when this category was introduced first. The knife on the left on the picture is the oldest and it got some small differences on the tang stamp and emblem. The crossbow is a bit different and this is a type I have seen on knives in the 1970s-early 1980s from Wenger. I have put this knife on the left to 1980 for now. As i did menton i am interested in learning more about these knives and how old this category is, please let me know. On the picture are knives from 1980-1990s. If you search on the internet you will see that there are different models out there. Color variations as well! In general these knives are low cost for the quality and I usually call them gentleman type knives at least the ones on the picture. A gentleman knife does not have to be so expensive as long as the quality is present. These are high quality, lightweight and slim 85mm knives. Eloxy knives was in Wenger`s inventory in 2013. 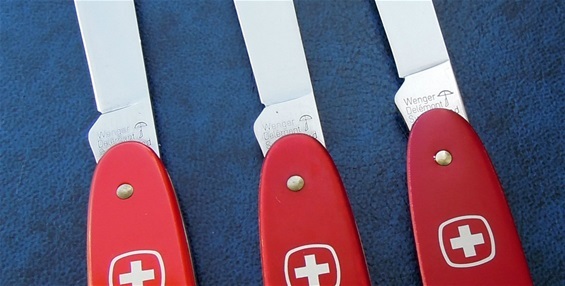 Victorinox got the knives with the designation Alox and Wenger Eloxy for knives with Aluminum handles. On the picture below the older knife is on top. There are many small differences included production methods. The color on the aluminum handles is a bit different as well. It is a bit worn but i know that the red color may have variations anyhow. On the internet you can find different names and one of them is Patriot but this is usually on the key ring model. Individual names and name on the category may be different. it is not so easy for the camera to picture the shade variations. There are several differences on them and that is fun for me. Here are some follow up on the Eloxy or Alox type 85mm knives by Wenger. On the pictures are three with the same configuration. They are from different time periods in history. The two on the right I have already shown and discussed above. The oldest is the one on the left with an even lighter red color shade. This is the nicest looking of all three. The number on these knives or what they are referred to is 1.84.00 or 1.84.00 S that I mentioned above too. I did take notice on the crossbow on the tang stamp that is interesting on the oldest one. 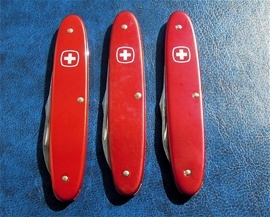 This is a type that you can see on the middle one as well and this is a type you can see used on Wenger knives in the 1970s. It is clear that the color went from light red that is close to orange in some angles. I am very glad I found this because it will complete some questions on them and I can try to find a date. With this knife was a plastic holder that is light blue and not dark blue like the later ones. It is not faded by time because that is the same color on the inside as out. 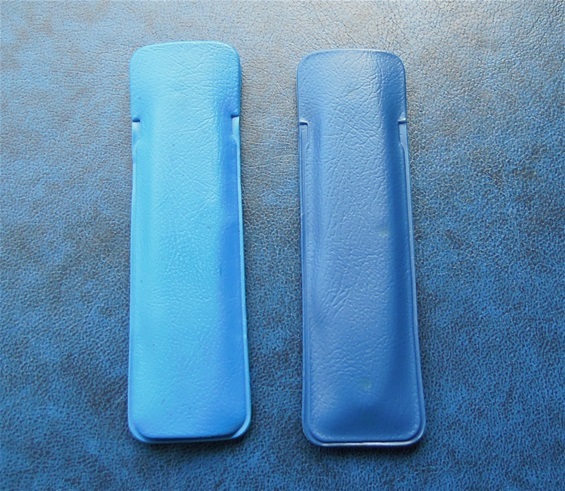 So we can say that the early plastic holder was lighter blue. One must be careful when finding a date on them. I have seen the crossbow stamp used in the 1970s and some early 1980s. I am not 100% convinced that the light blue plastic holder is for this early knife yet. It could be for the middle knife maybe. I know the text is a bit heavy for many readers. Looking on the knives it seems that the aluminum handle scales was smoother on the surface and later it is not so smooth. These knives have seen some different numbers and I was not sure 1.84.00 was correct on the oldest one. I found some information from an older source that confirms 1.84.00 and I have seen on a different place this knife with such a number. Another important factor is the designation of the knives and if or maybe a possibility for a more budget made compared to a more high end made. There are many factors involved that can be the reason for why the emblem on the handle scale is slanted a bit to the left with an angle. It is most likely a production variation that is interesting. It is not enough that it is a problem of any kind. I can see on other knives with the same configuration that the emblem is many times a bit more to the left but not with this angle shown today. Aluminum handle scales are usually anodized and colored with processes. Wenger has called the handle scales Eloxy in periods and mentioned aluminum. If the handles scales are not always aluminum I am not sure about. Wenger are known to use different metals and materials in history. Other details are the use of anodizing types and similar processes. Coloring and methods used there as well. I would believe the shape and design of the over-all construction and handles scales that this is the reason for why the emblem is a bit left on many. The angle however is a bit more and it could be no more than an adjustment in the production that was not 100% correct. Production variations are to me extra interesting because every small change or detail can tell a big story. We have the evolution and the introduction of production methods up in the history. I am also convinced that sometimes there are small things that are on purpose and with some importance. This is a small factor that must be remembered. The same is with tang stamps in history with production methods, materials, processes, polishing and stamp modules that are new or worn. It is in the production different pressure used that have a great influence on the tang stamp. From the 1970s and up the Wenger tang stamps got more and more precise. It is therefore a bit more difficult to see the difference but when you use a magnifier you see the difference better. The depth, width, letters and many other factors give 100% proof of not only variations but also the deliberate evolution, stamp modules and protection of the Wenger Brands products. There is no longer any doubt about this because thus more precise the production and stamps get the possibility for using them as receipt for the protection and guarantee are present. If you look on the Wenger tang stamps you can see just how extremely accurate they are. This is best seen from the late 1980s and up to the last Pre 2013. I do believe the tang stamp show above are a type from the late 1970s. It is not the most precise yet. Another detail worth mentioning is the rivets that are because of the construction and springs a bit to the left at both ends. Then the emblem also fit best a bit towards the left. Let me know Your feel on this. 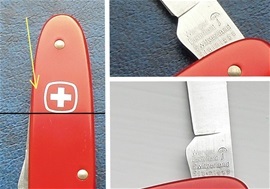 Wenger protected their products against copies and fakes by not only using precision in the production but also by using tang stamps that are so accurate and well-designed that it was impossible to fake them.